Valverde has not picked him since and he was a surprise exclusion from Barca’s squad for Thursday’s second leg against Levante, with the Catalans needing to come from behind to reach the quarterfinals of a competition they have won in each of the last four seasons. Even Denis Suarez — who is pushing for a move to Arsenal — has been included in the 18-man squad. Valverde is campaigning for the midfielder to stay. Before moving to Barca, Malcom drew interest from a range of English and Italian sides, including Roma, Tottenham and Arsenal. Guangzhou Evergrande of the Chinese Super League are also mooted as potential suitors. There are no complaints from Barca about Malcom’s attitude. Despite various setbacks — he has been omitted from various match day squads and has suffered two hamstring injuries — he has never complained and has always prioritised working hard to earn his place in the side. Things looked to have turned around when he scored against Inter Milan in the Champions League in November, but an injury sustained soon after in a cup game set him back once again. 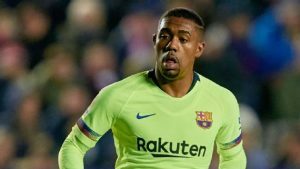 Moving to Barca last summer was a dream come true for Malcom, but circumstances may have to force him to reconsider his next move if the La Liga leaders receive an offer which matches their asking price this month. A move to China could even happen up until the end of February.